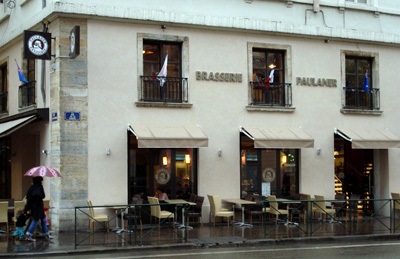 The Brasserie Georges was created in 1836. It is located in the heart of Lyon, near the Perrache train station. While a bit noisy (it’s a very large room), the restaurant is comfortable. The list of celebrities who visited the Brasserie Georges is practically endless. From Auguste Rodin and Jean-Paul Sartres to the Emperor of Japan and Bill Clinton, the list looks like a compilation of the who’s who from the 19th to the 20th century. The service was very good. Our waiter made genuine efforts to please us. As a practical detail, the card is both in French and English. I started with a very typical salad lyonnaise (Salad, warm bacon cubes, croutons and poached egg). It was very good but the egg was a bit too cooked to my taste. I would have preferred to be able to mix the warm and still liquid yolk to the salad. As main course I had the saucisson chaud. 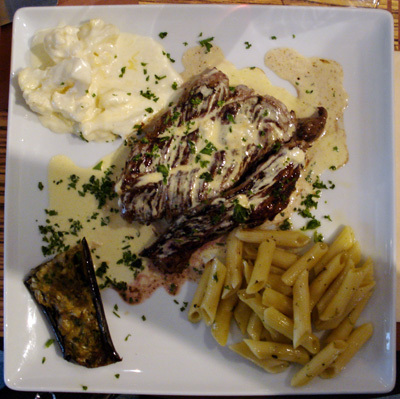 Again a very typical dish from Lyon. It is a pistachio sausage that is cooked on order. 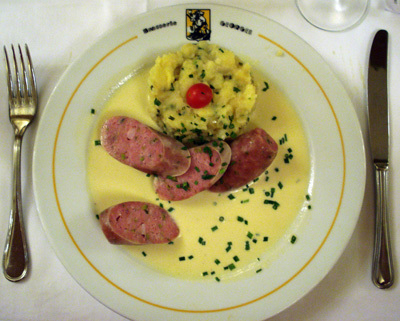 The saucisson chaud was server with absolutely terrific mash potatoes. 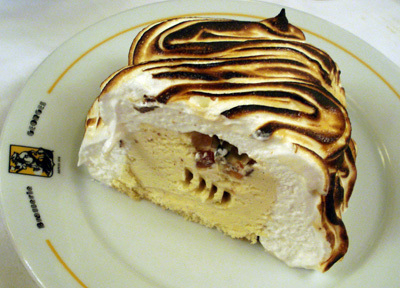 As desert, I shared a baked Alaska. As strange as it sounds it’s a baked ice cream. You put ice cream on a sponge cake, cover it with meringue and bake it just enough to cook the meringue without melting the ice cream. At the Brasserie Georges, they add Fruits confits on top of the ice cream and a bit of Kirsch in the meringue. It was very good but far too large for me to finish it. 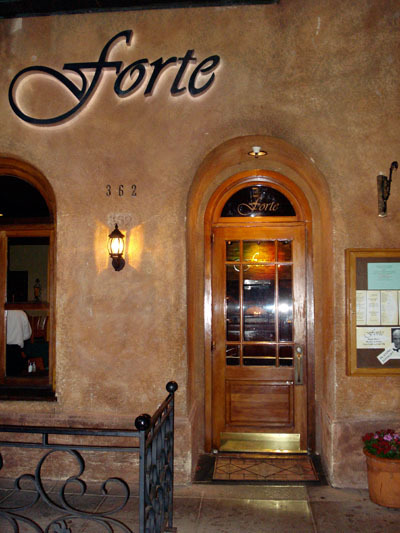 Around $50, including drinks (kir, red wine, espresso) and tip. 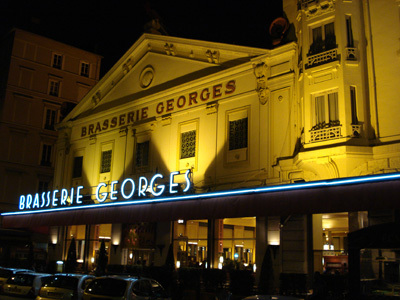 If you consider the food, the restaurant and the current strength of the euro the Brasserie Georges offers excellent value for money. I will definitely come back. 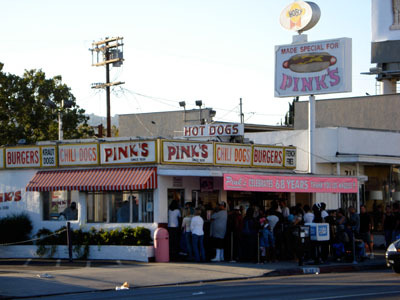 Pink’s Hot Dogs is located in the heart of Hollywood. 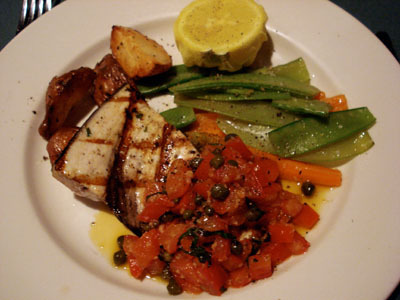 The restaurant is extremely casual, so don’t expect much comfort. The place could really do with an update. As parking is difficult in the area, Pink’s Hot Dogs provide a decent parking lot for customers. There is no real service at Pink’s Hot Dogs. You queue to order your food and when your food is ready, you move to the cashier to get your drink and pay. While the line is usually pretty long, it goes pretty fast and the staff really seems to make an effort. I ordered a “Ozzy” spicy dog and onion rings. The “Ozzy” spicy dog is a spicy polish sausage topped with Nacho cheese, American cheese, grilled onions, guacamole & chopped tomatoes. I have to say that I heard so much about Pink’s Hot Dogs that I was skeptical. What I was served convinced me. The bun was fresh, the sausage was really good, far from the cheap industrial kind you usually gets, and they are generous on the topping. One regret: the onion rings were a bit overcooked. Around $10, including drinks (coke) and tip. 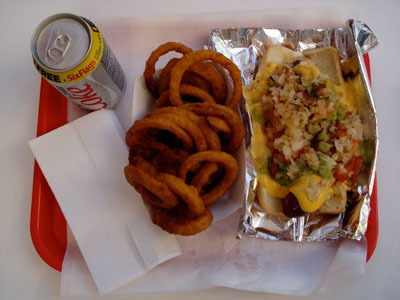 Without doubt, Pink’s Hot Dogs offers the best dog in town and an excellent value for money. Watch out for updates as I will go back. 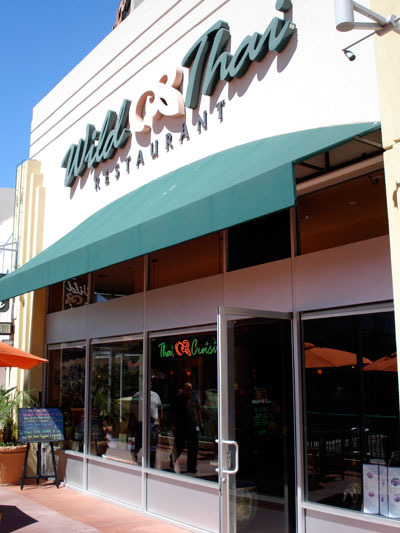 Wild Thai is located on the first floor of the promenade, a Los Angeles mall bordering Culver City. The Thai themed decor is alright. Seating is more or less comfortable, depending on the table. Priority is given to practicality over customer care. For example, tables are covered with glass. That make them easy to glass but it definitely detracts from the experience. The service was good but no special effort is made. They just try to keep up with the flow of customers coming for lunch. 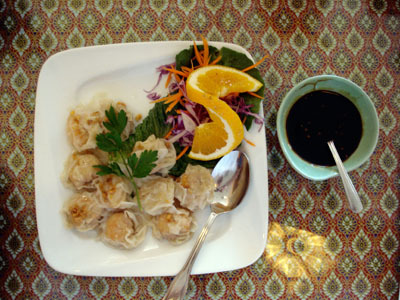 To start, I shared steam shrimp dumplings. The dumplings were good but a bit overcooked. The crunchy bits on the top are definitely a good idea. As main course, I had Prik King with chicken and tofu. 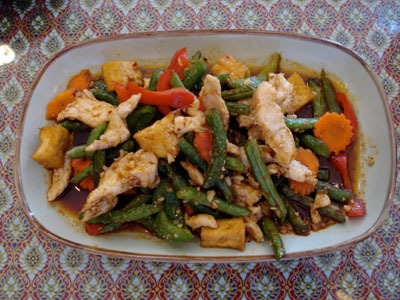 The dish is marked as spicy but is relatively mild. It was very good apart the tofu which was very rubbery. 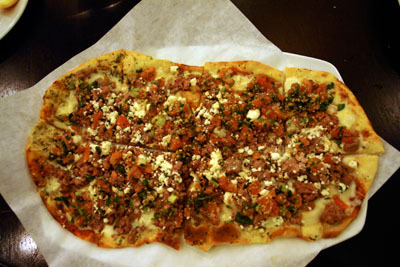 Mama Dip’s Kitchen is located in the center of Chapel hill. 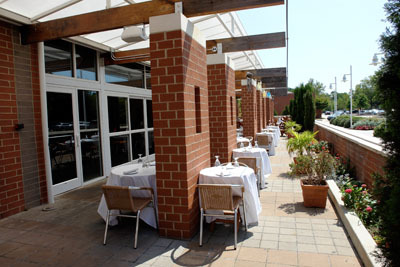 You can eat either inside or on the terrace. Inside, the restaurant is reasonably comfortable for a casual place. The service was good. You waitress always made sure that our sweet tea was always filled up. You can definitely feel a southern flair here. I shared a Sampler Platter as starter. The platter was composed of hushpuppies, fried green tomatoes, fried zucchini, fried cheese and broccoli sticks and bread and butter pickles. I had hushpuppies at Mama Dip’s Kitchen before that were better than this ones. Don’t get wrong, they were not bad but they could have been a bit softer. If you have never tried bread and butter pickles before, this is your chance as they are really excellent. As main course, I had southern fried chicken. The side dishes were buttered broccoli, baby Lima beans, green peas & potatoes and cornbread. The chicken was really good, crispy outside and tender inside. While all the side dishes were good the Lima beans were particularly good, just cooked right with the right amount of butter. 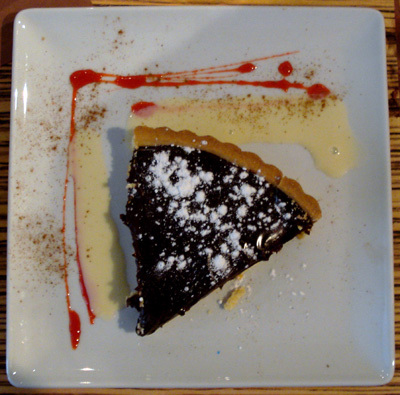 For desert, I had a slice of sweet potato pie. The pie was really light and truly excellent. Around $25, including drinks (sweet tea) and tip. 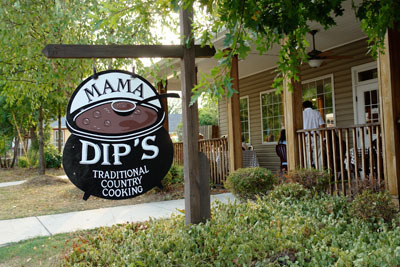 Mama Dip’s Kitchen offers very good value for money and an authentic southern cooking experience. 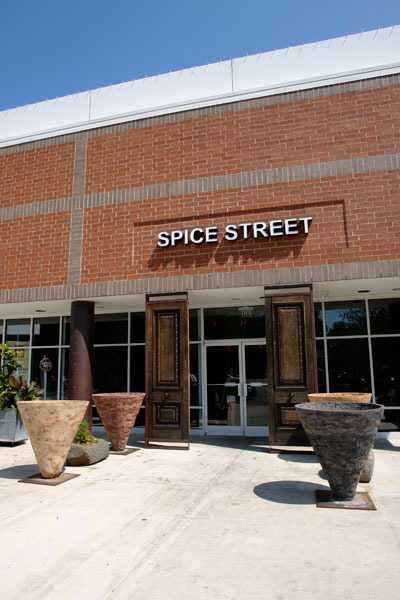 One word of advice: If you don’t like fried food or butter, this is not a restaurant for you. 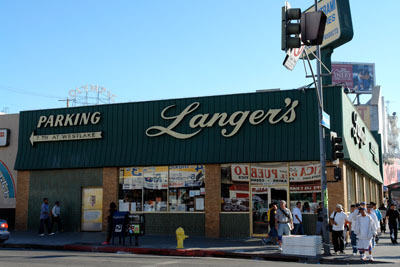 Langer’s Deli is located at the corner of MacArthur park, in the heart of Los Angeles. While the retro look has it charm, the restaurant could do with an update. Parking in the area is difficult, so you should take advantage of the fact that Langer’s Deli give one hour of parking validation. Service was good but totally unremarkable. An effort on that side would be appreciated. I had the very famous number 19. Number 19 is a pastrami sandwich with swiss cheese, cole slaw and a Russian style dressing. The bread was toasted in a way to make it crackling outside and tender in the middle. The very good cole slaw was home made and the pastrami, thick sliced, was warm and delicious. Averall, one of the best pastrami sandwich I had. You should note that the semi-sour pickles served on the side were equally good. Around $15, including drinks (ice tea) and tip. At $15, Langer’s Deli offers both a good value for money and a really authentic deli experience. I will certainly come back. 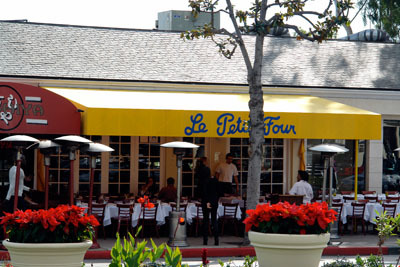 Le petit four is located at the very hip sunset plaza. You can eat either inside or outside. Inside, the restaurant is quite comfortable. Outside, while the terrace is significantly less comfortable (cramped tables, noisy street) the atmosphere below the yellow awnings is very pleasant. 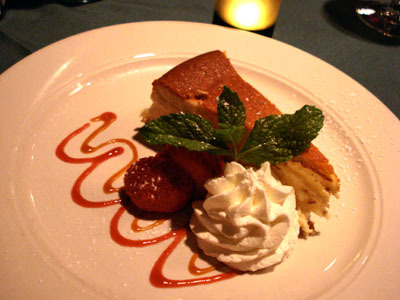 Don’t be surprise if a tourist bus stop by for pictures, Le petit four is a favorite eating spot of the entertainment industry. While the service was relatively good, they certainly could do with more staff. I started with a tomato gazpacho. 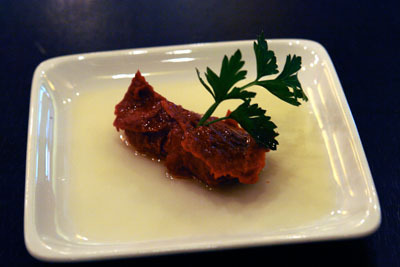 The gazpacho was served mostly blended in a large soup plate. Lightly spicy, it was very refreshing. As main course, I had the onglet (French for hanger steak). 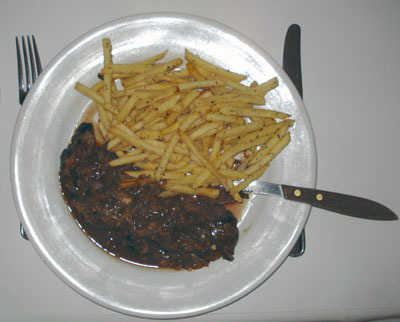 The onglet was served with an excellent shallot and wine sauce and accompanied by French fries with herbes de Provence. Served medium rare to keep it tender, the meat was tender and tasty. The Herbes de provence (a blend of dried aromatic herbs invented in the 1970s in Provence) add a very nice twist to the French fries. For desert, we were asked to choose from their very large desert platter. 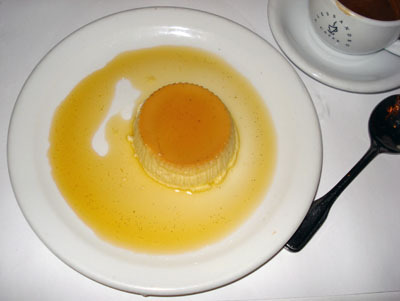 I had a very classic creme caramel. The creme caramel, small and tasty, was very good. A light refreshing end to the meal. Around $40, including drinks (ice tea, espresso) and tip. 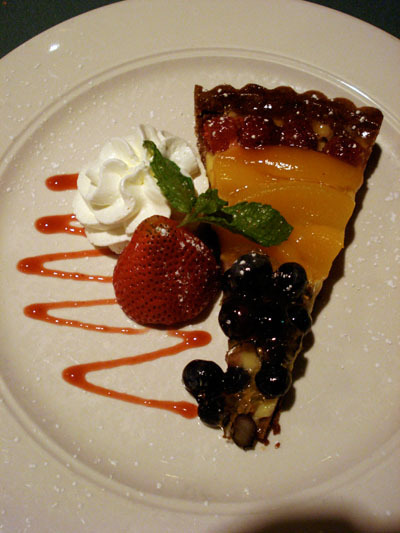 Considering the neighborhood and the food, Le petit four offers a very good value for money. I’ve been going there regularly and it is still one of my favorite brunch spot. See you there!